Welcome to the CMC markets platform. The first time you log in to the platform, you'll notice a number of pre-set default layouts to choose from. It's possible to save up to five different layouts, which you can switch between at any time. You can navigate around the platform using the main tool bar. From here you can search for products, create watch lists, view market news and analysis, use trading tools, view your account details, make payments, and develop your skills with our support area. Let's start by opening up a blank layout. From here you can build your own layout from scratch. The product library is your gateway to the world's financial markets, and it's here that you'll find the wide range of global products that we offer. You can search for a product by entering its name into the search field, and the results will update in real time, or you can filter by type, such as commodities, shares, currencies, indices, or treasuries. You can go on to filter your results further by country. It's also possible to filter by price performance and even volatility. You can also easily filter product types by All, Cash, or Forwards. By clicking on the product menu icon, you can gain access to a variety of different functions. Using the order ticket allows you to place trades with optional risk management, while charts allows you to see the historical chart actions, plus add a series of technical indicators. The price quote window gives you price centric information such as the real time spread, daily highs and lows, plus the daily price percentage change. You can use the product overview to get information on margin rates, position limits, holding rates, and trading hours. Client sentiment, which is very useful, gives insight to the current view of buyers versus sellers of the product. If you are looking for the latest Reuters news headlines, then click here. The chat forum allows you to view, copy, and share technical analysis with other traders, while the price alerts will inform you when a specific price level has been broken. It's possible to use or add this product to a specific watch list or create a new one. The portfolio mixer allows you to analyse the aggregate price performance of a selection of different products. Finally, order settings will give you access to set order preference defaults specific to this product, though you can also do this across all asset types in the order settings section here. You can also use the module-linking feature here, or within the module header here. If you link two or more modules together within the same colour group, changing the product in one will automatically change the product in the other. You can change the product displayed in certain modules by clicking the search icon here. Let's return to the product library. If you want to save the search and filter results in your product library as a watch list, you can do so at any time. Your watch list is then automatically generated. You can see the product name, the highs, lows, and point and percentage changes for the day, as well as your product's current buy and sell prices. Your account summary is displayed here. This is how much margin is currently being used for open positions, and this is the amount that is available to open new positions. This figure tells you how much cash you have on your account and here is your real time profit or loss, plus a summary of your entire account value. From here you can also see a more detailed view of your account value. You can also choose to hide these details or reveal them again. You can view your positions in the account section. From here you can see the name of the product, whether you've bought or sold, the number of units traded, and your real time profit or loss. It's also possible to amend and set stop loss and take profit orders. You can close out any trade by clicking the X icon here. Each product has a live streaming buy and sell price. Use the buy price if you think the price is going to rise and the sell price if you think it's going to go down. In this example, we will buy. Clicking on the price launches an order ticket. The order ticket clearly displays the product name, the sell and buy price, the daily low and high price levels, the real time spread, and the direction of your trade. You can swap the direction of the trade easily by clicking the relevant sell or buy price box. First of all, you need to choose your position size. You can specify this in units or amount. However, if you specify a position as an amount, please note that it will automatically be converted to units. Let's use units for this example, then hit return. The amount of money required for margin is displayed here. It is possible to add a stop loss with your order by clicking here. Stop loss orders can be set at a specific price level, or according to approximate amount of money you would like to risk, or even by a set number of points distance from the current market price. It's also possible to set a regular, trailing, or guaranteed stop loss order. Guaranteed stop loss orders work the same as regular stop losses, except they're guaranteed to close out trades at the price specified regardless of volatility or gapping. There is a premium paid when placing a guaranteed stop loss order.You can also add a take profit order, which you can set by target price by approximate amount of money you would like to gain from the position or a set number of points distance from the current market price. You can also view and amend your risk management levels directly from the chart. You can see the current market price and then set the potential take profit and stop loss orders from here. This allows more effective risk management placement, as you can compare your levels to historical prices. If you are ready to place your trade, you can now go ahead and confirm your order, and the trade has been executed. Your trade will now appear in your account window where you will be able to see it updating in real time. 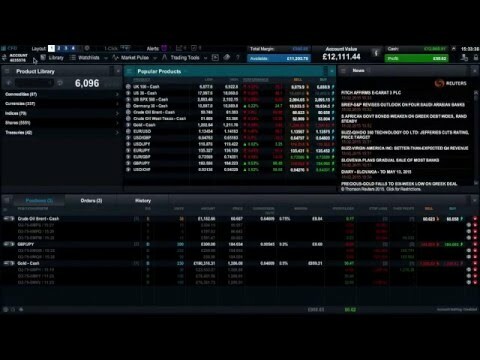 All the details of the trade are visible, including the real time profit or loss. You can also edit and add stop loss or take profit orders from here, and you can close out of the position by clicking the red X icon. Be sure to view our other guided tour videos for more details on specific platform features.